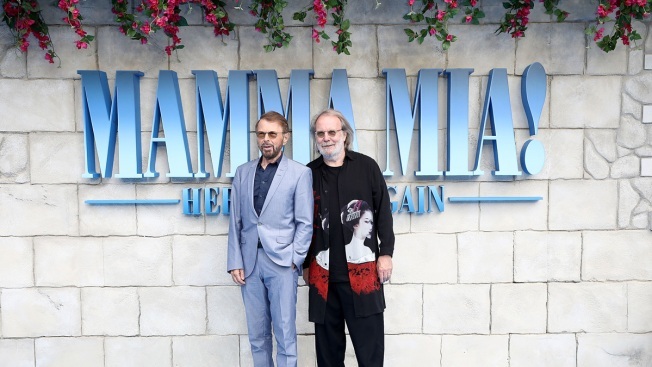 In this July 16, 2018, file photo, Bjorn Ulvaeus and Benny Andersson of Abba attend the UK Premiere of "Mamma Mia! Here We Go Again" at Eventim Apollo in London, England. ABBA's Bjorn Ulvaeus says fans can expect a new song "in September or October" from the four-member Swedish pop group that broke up 37 years ago. Ulvaeus told Denmark's Ekstra Bladet tabloid on Wednesday that "it takes an extremely long time" to make the video with the avatars of the group members, adding "it has been delayed for too long." The band earlier said Ulvaeus, Benny Andersson, Anni-Frid Lyngstad and Agnetha Faltskog reunited to plan a virtual tour featuring digital avatars, and that one of the two new songs is entitled "I Still Have Faith in You." ABBA shot to fame by winning the 1974 Eurovision Song Contest with "Waterloo," and had big hits in the 1970s including "Dancing Queen" before splitting up in 1982. Amanda Seyfried and Jimmy Fallon take turns singing classic ABBA songs, like "Dancing Queen," which turns into "Hula Prince" after running the lyrics through Google Translate.